Bithumb.com Review 2019 – Scam or Not? The search for the best Bitcoin exchange websites is clear not hindered by mere language barriers. 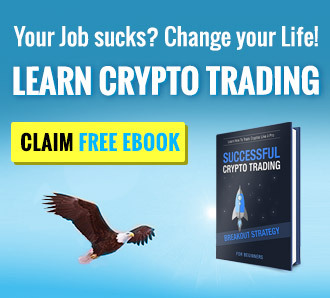 There are hundreds of websites out there today that offer exchange services for the cryptocurrency. The challenge is finding those websites! Do you know that feeling that you just had the best ramen in the world in some random hole-in-the-wall ramen shop in Japan? You get that same feeling when you find an exchange website that offers great services for a lesser cost. Today, we will be looking into the largest South Korean cryptocurrency exchange website called Bithumb.com. According to the website Coinmarketcap.com, Bithumb is currently the number 1 to 24-hour volume exchange rankings with Bitfinex trailing at 2nd place. The largest volume trade for this day the review is being written would be the Ripple and Korean Won pair (XRP/KRW). We bet that got you interested! We will be looking into what Bithumb.com has when it comes to creating an account, website features, how to trade, how to purchase cryptocurrencies through their website and get a general feeling of what they have without visiting the website yourself. Without further delay, let’s talk about that! As mentioned above, Bithumb.com is the largest South Korean exchange website by volume and is easily one of the leaders in the global market today. The company behind the website is called BTC Korea.com Co. Ltd., and has their main headquarters located in Seoul, South Korea. Initially, they had an issue with a hacker having to access their website and steal millions of dollars worth of cryptocurrency, this is a serious matter that needs to be put into consideration if you want to invest money into this exchange. Our best advice is to get in there, earn what you can, and do not let your investment sit for longer periods of time. Once a website has been previously hacked, and due to the traffic that they generate, it wouldn’t be impossible to happen again in the future. The company, however, has vowed to pay back all losses that happened mid-2017. The company’s physical address is at 17, Teheran-ro 16-gil, Gangnam-gu, Seoul, Korea (Dongwoo Building) and their CEO is Kim Jae-Wook. The company has been operating smoothly since 2013 until the recent hacking issue that happened this year. 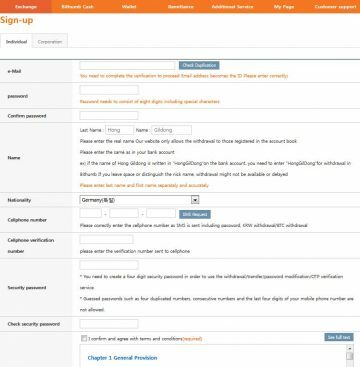 Now we’ve got that all out of our way, let’s start and create an account with Bithumb.com. As we all know, there are websites that offer different kinds of verification level, let’s look if they have that here in Bithumb and start with creating an account! To create an account, of course, we need to head on to their website and click the Sign-up button located on the upper right-hand side of the website. Creating an account on this website is not easy! We were actually amazed on how many spaces there was to complete just to create an account with them. Is this because of the recent hack issue? If you guys have created an account with them around 2016, please do let us know if it’s always been like this in the comment section below. There were a bunch of really sensitive information that we did not want to provide like mobile phone number and our complete name. We left the mobile phone number space blank and provided an awesome alias. We got to be honest; creating an account with them is not as easy as you think it is! We ended up not providing our phone number and just looked at a picture of their trading platform. Their website has a lot of features that include Bithumb Cash, KRW Remittance, and coupons that will drastically bring down your trading fee from 0% up to 0.075%. Their website’s trading platform might not have any problems but their website tabs do have some latency issues, this might be the number of trades, or something else. They also have a virtual account that you are able to play with but require their customer to complete the verification process. One of the most important features this website has is their guide page. Here everything is properly explained (in Korean) through pictures (with English translation) on how to create an account. What’s also great is that they’ve got a customer service phone number which you are able to contact through 82-1661-5551 that is active 24 hours a day, 7 days a week, and 365 days a year. We’ve come to the most important part of the exchange website and that would be their trading platform. In general, their trading platform is great since there were no lags experienced when going through different tabs (unlike their main website). On the provided screenshot, we are able to see the markets listed on the left-hand side panel. These are cryptocurrencies namely BTC, ETH, DASH, LTC, ETC, and a couple more. Click on the desired cryptocurrency you want to trade and enter how much you want to purchase or sell with that single transaction. On the right-hand side of the trading platform, you have their market status and all the latest transactions. In addition, they have three different trade tabs. These are namely General Trade, wherein you get to see first once you have clicked on their platform. The second one is called Easy Trade, and this tab is for automatic transactions that have a more “active feel” since the transaction value change in real time. For reserved trade, this is like futures wherein you are able to place an order for a specific base price. 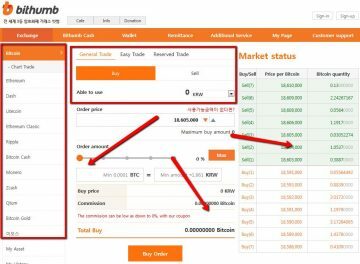 The basic commission for trading here at Bithumb.com is 0.15% for both maker and taker fee per transaction. And as mentioned earlier, if you have one of their coupons, the commission fee can go down to 0% or a maximum of 0.75%! Way cheaper than most western exchange websites today. Deposits and here at Bithumb.com are free for all cryptocurrencies. For KRW, deposits are free but they charge you 1,000 KRW per transaction when you want to withdraw your money. They do accept wire transfers for local Korean banks, if you want to transact using Fiat. Withdrawal for cryptocurrencies would depend on which currency you want to withdraw to your personal wallet. For BTC it’s at 0.0005 per transaction. To get a full list of their fee schedules please click this link. The website is not that bad, but it’s clear that this was designed for the South Korean audience. Their website might have issues when it comes to latency and some parts are not completely translated into English, which really forced us to have a hard time reviewing the website. All-in-all, Bithumb.com is not that bad especially if you are from the region. If you are from the western side of the world, we would suggest looking for something closer based on you. But as mentioned, the website is bad and it has all the features that an exchange needs.